If you live or work in North Miami, you probably know people who use or drive for Uber or Lyft. Maybe you use Uber or you drive for Lyft and Uber. But what happens when an Uber accident happens? That is when you should call a North Miami Uber accident lawyer. The North Miami Uber injury attorneys at the Wolfson Law Firm represent Uber passengers and drivers in personal injury claims. Our Miami personal injury law firm have helped personal injury victims in North Miami and all throughout South Florida since 1963. We know what to do if you were injured in a North Miami Uber car accident. Give us a call at (305) 285-1115 and let’s discuss your options. Our Miami personal injury lawyers have seen the explosion of Uber in South Florida. The best information to date is that there are nearly 10,000 Uber drivers in Miami-Dade County alone. These Uber drivers aren’t just dropping passenger off either. Now they are delivering food for UberEATS. 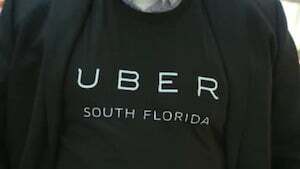 Since the beginning of Uber in South Florida, drivers have made deliveries for businesses and professionals like law offices and doctors. All of that activity increases the risk for all of us. It also raises the potential of injury to Uber drivers. At the Wolfson Law Firm, one of our personal injury team members is a former Uber and Lyft driver himself. He worked the long hours. He had great customers and others that were not so great. The one thing about Uber drivers is this – they work long hard hours and the money they make isn’t what everyone thinks it is at the end of the day. Uber drivers who put in over 20 hours a week are probably averaging about $10 per hour if they are lucky. It might be less when they factor in all of their expenses. A lot of people sign up, drive for a while and then realize that it wasn’t what they imagined. Most Uber drivers don’t carry their own personal insurance that will cover them when they are driving Uber. In fact, most insurance companies will exclude coverage for an Uber driver unless that driver disclosed that they were using their car to drive Uber. But Uber is supposed to provide $1 million dollars in coverage for their drivers and passengers when they are in the act of using Uber. Our clients include Uber drivers and passengers. Uber has been placed on notice and our clients claims are pending. Our North Miami Uber accident lawyers are prepared to do whatever is necessary to hold Uber and its insurance company to the promises made to Uber drivers and passengers. Our Miami personal injury attorneys can help you after your Uber injury accident in North Miami. We offer a free and confidential consultation either in our office or wherever is best for you. Our lawyers are licensed to practice law in Florida and regularly appear in courtrooms throughout South Florida on a regular basis. Even if you haven’t had an Uber accident in North Miami, our Miami personal injury attorneys will speak with you to help you understand what to do after an Uber accident in Miami. We will answer your questions free of charge. All you need to do is call us at (305) 285-1115. If you or a loved one were injured because of the negligence or intentional act of another, call the Miami personal injury lawyers at the Wolfson Law Firm. We are available to take your call 24/7 at (305) 285-1115. Our Miami injury attorneys serve the North Miami community as well as the surrounding areas of Opa Locka, Sunny Isles, Golden Glades, Miami Gardens, Aventura, North Miami Beach, Miami Shores, San Souci Estates, Keystone Islands, Golden Beach and Biscayne Park.